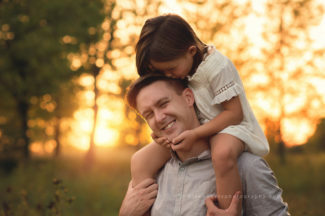 Darcy and Randy are known for capturing sweet moments, candids, and family connection. Family portraits fill fast; please plan ahead! 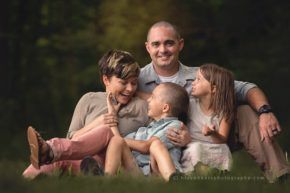 Please take a moment to check out the artists’ portfolio so you can get an idea of the style of images we create and so you know what to expect in your own gallery: http://hisandhersphotography.com/portfolio/family-portraits/. All sessions held outdoors and take advantage of Iowa’s changing landscapes. Sessions photographed ~2 hours before sunset. Season is typically May – October; additional sessions added as mild weather permits. Please stick to small children’s usual napping, eating and bedtimes. $250 for 2-6 immediate nuclear members. Creative Fee is a retainer that reserves your date, covers your session, the time and talent of the photographer, as well as fine-art editing and retouching of 25 images in your gallery. Creative Fee does not include any prints or products. Canvas art, albums, announcement cards, gift prints, wall prints, boutique framing, and digital collections are all available. Prints start at $54. Collections begin at $790. About 3-4 weeks after your session, we invite you back to the studio to see your images. 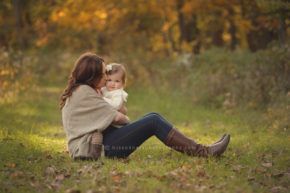 You will see your gallery of beautifully edited images, as well as all the gorgeous products available to you. Your order will be placed at this Viewing & Ordering Session, and we will let you know when you can anticipate your products to arrive. Typical turn around time is about 7-10 business days for prints, longer for specialty items such as albums and frames. Many consider this the most stressful part. No worries. We’ll help! We love to be part of styling and we will send you tips and guidelines for what to wear. Nature-cohesive color plays an important role in our style. Take a peek at the artists’ portfolio to see how the artists use color to create images for you. Once you are on the calendar, we will work with you to help you create a look you love for your walls, for gifts, and for family keepsakes. Wonderful! We’d love to be part of capturing your family’s ages and stages! 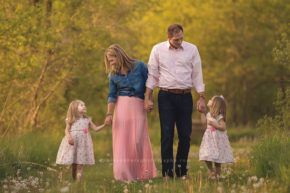 Please contact us to start planning your family’s session. Thanks for considering His & Hers. It’s a privilege to be part of your memories.